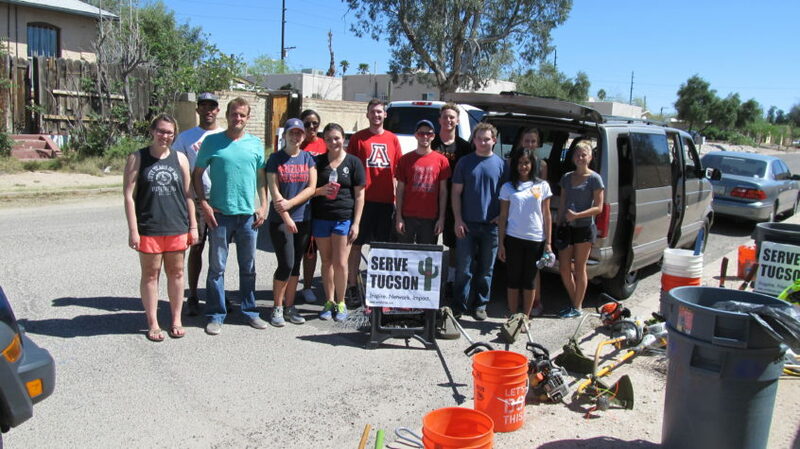 Groups: Volunteer groups from the U of A, churches, schools, businesses and others contact us to find projects to work on. We ask for some basic information: the day and time they are available, the number and ages of volunteers, what part of the city is close to them, if they have a focus they are looking for, etc. Some groups offer to help with supply, tool and food/drink costs as well. Then we find them something to do! If time allows, we can then find other local partners to join us on a project. If the group is large, like 50+, then we try to create an “area partnership.” We find 2-3 local schools and others to join us. For example, on September 10, 2016, we had about 250 volunteers serving at and around the Pueblo, Hollinger and Rose schools area! We like to inspire involvement by our example … to awaken those who walk and drive by. Individuals: Individuals can check our calendar or receive our email updates. We post events on our calendar that we are directly involved in. We include some additional options in our email updates. Volunteers can just show up and help out, or find links for more info on other projects. We can sign off on community service paperwork if needed. We also encourage individuals to take action as they see it. For example, you can keep a small broom and dustpan or trash picker in your car trunk so you can stop and clean up broken glass or messes right away in your area!